Texture in OpenGL represents the image that may wrap a character. For example, the image below shows a character without texture and one with texture. Buffers are linear blocks of untyped data and can be seen as generic memory allocations. Textures are multidimensional data, such as images. are stored in OpenGL Buffers. In contrast, image data is stored in OpenGL Texture Objects. We use the following functions to create, bind, and allocate texture storage. One of the first problems that I had with OpenGL textures was understanding the use of Targets. It turns out that Targets are quite simple and straightforward. A texture Target determines the Type of the texture object. For example, the texture we have created is a 2D texture. Thus, the texture object is bound to a 2D texture Target, GL_TEXTURE_2D. If you had a 1D texture, then you would bind the texture object to a 1D texture target, GL_TEXTURE_1D. Since you will be using images, you will find yourself using GL_TEXTURE_2D quite a lot. This is because images are 2D representation of data. Once a texture object is bound and contains data, it is ready for a shader to use it. In shaders, textures are declared as uniform Sampler Variables. The Sampler dimension corresponds to the texture dimensionality. Our texture is a 2D texture, thus it must be represented by a 2-dimensional sampler. The sampler type that represents 2-dimensional textures is sampler2D. If your texture is 1D, the sampler to use is sampler1D. If the texture is 3D, the sampler to use is sampler3D. A Sampler represents the texture and sampling parameters. Whereas, texture coordinates represents coordinates which ranges from 0.0 to 1.0. These two set of information is what we need to apply a texture to an object. You already know how to represent a texture in a shader, i.e. using Sampler. But how do you get the texture coordinates in shaders? Character data is sent to the GPU through OpenGL buffers. You load these buffers with data representing the attributes of your character. These attributes can be vertices position, normals or texture coordinates. Texture coordinates are also known as UV coordinates. A Vertex Shader receives this information through variables known as Vertex Attributes. Only the Vertex Shader can receive Vertex Attribute data. The tessellation, geometry and fragment shader can't. If these shaders need this data, you must pass it down from the vertex shader. Thus, the vertex shader receives the texture coordinates through vertex attributes variables. It then passes the coordinates down to the fragment shader. Once the coordinates are in the fragment shader, OpenGL can apply the texture to an object. Listing 6 shows the texture coordinates declared as vertex attribute. In the main function, the coordinates are passed to the fragment shader unmodified. Listing 7 shows how the function texture() uses the sampler information and the texture coordinates to apply the image to a fragment. Samplers retrieve texture data found in Texture Units. 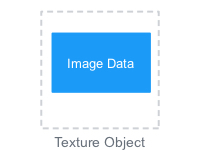 A texture unit contains a Texture Object and a Sampler Object. You already know what a texture object is. Lets talk a bit about sampler objects. Texture coordinates ranges between 0.0 and 1.0. OpenGL lets you decide what to do with coordinates that fall outside this range. This is called Wrapping Mode. OpenGL also lets you decide what to do when pixels don't have a 1 to 1 ratio with texels on a texture. This is called Filtering Mode. A sampler object stores the wrapping and filtering parameters that control a texture. A sampler requires both the texture object and the sampler object to bind to a texture unit. When this set of data is complete, the sampler has all the information required to apply a texture. In special circumstances, you would create a sampler object and bind it to a texture unit. But most of the time, you won't have to create a sampler object. This is because a texture object has a default sampler object which you can use. The default sampler object has a default wrapping/filtering mode parameters. I hope this post has been helpful. If you need me to clarify something, let me know. If you want to get your hands dirty with OpenGL Textures, do the project found in How to Apply Textures to a Game Character using OpenGL ES. What is the purpose of a Vertex Attribute in OpenGL?